So I have to admit something to you all- I used to not be a fan of Lilly. I only liked a couple prints and didn't want to shell out tons of money for an item that could only be worn in the spring and summer. However, the blogging world has opened my eyes to the fun of Lilly and made me want to buy a Lilly skort. So for the longest time I was on the search for the perfect skort and this pattern sealed the deal for me! The pattern is the sparkling blue version of Hey Bay Bay (love the name) and the scallop hem is just the cutest! I just love my new skort and had to style it for you all! 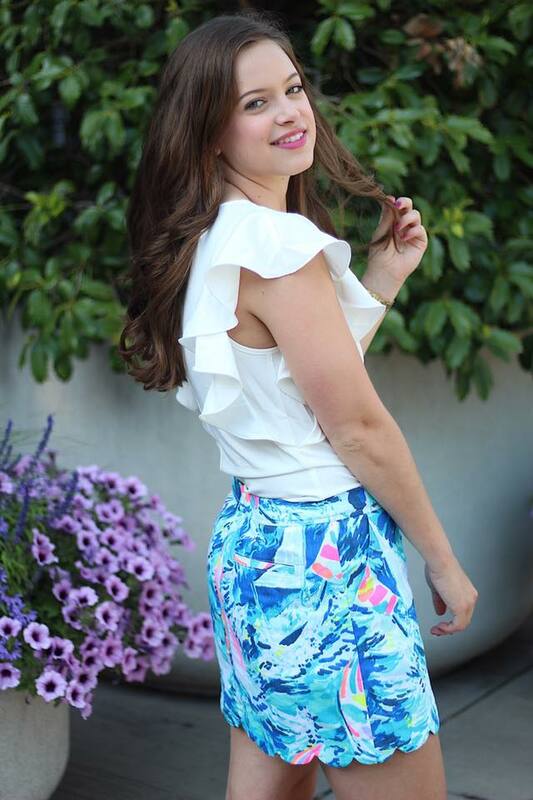 Elaborating on the print here, I love the blue tones in the skort- they remind me of the ocean (especially the beautiful waters of Turks and Caicos!). I also love the pops of coral and pink with the sailboats. The colors are combined so effortlessly in this print which made it so eye-catching to me. Now let's step back from the spotlight of the skort and take a look at this adorable ruffle blouse! I purchased it from Shein for $13. Yes- you heard that right! It has a thicker material making it hold its shape and flatter your figure! I have worn this top so many times this summer, and I have many blog posts planned featuring this fave of mine. A Lilly outfit is not complete without Jack Rogers sandals. That's why I chose to pair my favorite platinum JR's with this super preppy look. I mean why not make this outfit as preppy as it can be? I see no problem! I hope you enjoyed my first Lilly post on the blog! Let me know what some of your favorite prints are- I would love to know!